Many explanations have been given for the falloff in NFL ratings this season, including a backlash among fans to controversy surrounding players who protest by taking a knee during the National Anthem. A nationally representative survey of Americans conducted by Wall Street equities firm UBS finds that, in fact, is the No. 1 reason cited by those who said they watched less NFL coverage this year. 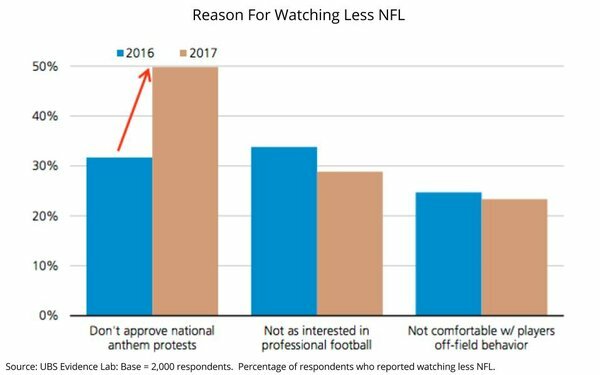 The finding -- part of a survey of 2,000 U.S. consumers conducted by UBS as part of its “Evidence Lab” -- is self-reported, but among those saying they watched less NFL coverage, 50% said they “don’t approve of National Anthem protests.” That’s up from the 30% who cited that reason when UBS conducted a similar survey a year ago. 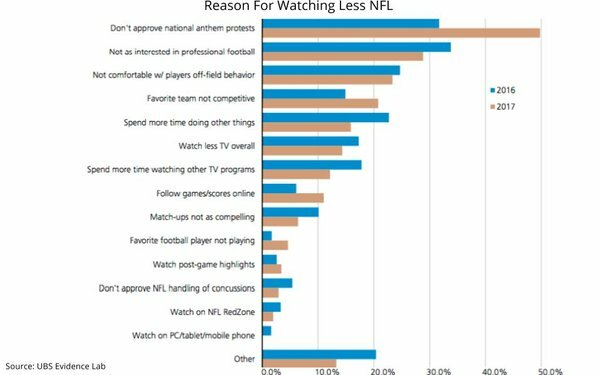 The second-biggest reason was respondents saying they are not as interested in professional football, followed by the response that they are “not comfortable with players' off-field behavior." The finding helps explain why NFL television ratings were off about 10% for the season that concluded with Sunday’s Super Bowl coverage. It also shows the influence President Donald Trump likely had in taking a stand on players taking a knee in protest. 5 comments about "NFL Ratings Slide 10%, Anthem Protests Cited". Douglas Ferguson from College of Charleston, February 7, 2018 at 11:15 a.m.
Not a surprise. I watched more televised games this year and even attended two NFL games in different cities, but the noticeable sentiment among my 60-something male friends on Facebook is, I'm done with the NFL over the flag protests, won't watch again until they end. Paula Lynn from Who Else Unlimited replied, February 7, 2018 at 11:32 a.m.
Ed Papazian from Media Dynamics Inc, February 7, 2018 at 11:44 a.m. Contrary to the absurd notion that NFL games on TV are "the only way to reach" the all important "Millennials" , the median age of the average minute NFL TV audience is about 50 years---which means that half of the viewers are over 50 years old. Losing a lot of these "oldsters" due to anger about players taking a knee while the national anthem is played----if this is really true----isn't a laughing matter. Mike May from Huge, February 7, 2018 at 12:12 p.m. It's a lot easier to stop doing something you don't love in the first place. The NFL saw evidence of fracturing fan engagement long before the protests started. Games getting longer, VAR, fantasy interest that replaces full-game watching with following individual players, and highlights through social and RedZone that allow people to retain conversational social fluency around the game all create disincentives to watch a full game, which is where their ratings numbers come from. The protests may go away, but they need to better align the fan experience with their business model if they want to climb out of the ratings slump. Rick Thomas from MediaRich Marketing, February 7, 2018 at 12:29 p.m.
Protest all you want NFL players. Good for you. And I will watch the games today like I have been watching them for 40 years. My Philadelphia Eagles won the SuperBowl!!!! Ratings for television in general have been declining for too many years. Americans viewing habits have been changing for too many years. Nobody does ANYTHING today as they did 40 years ago, 20 years ago, 10 years ago. Every day our habits of life change because of technology and because of protests like kneeling in the NFL. Women are protesting their treatment in the entertainment world, in the business world, in politics and I don't see anyone turning off women, ya think? You don't want to watch the games fine. Don't watch. Be miserable. But "Fly Eagles fly, on the road to victory!!!"